Ehrman makes the provocative case that many of our cherished biblical stories and widely held beliefs concerning the divinity of Jesus, the Trinity, and the divine origins of the Bible itself stem from both intentional and accidental alterations by scribes -- alterations that dramatically affected all subsequent versions of the Bible.Bart D. Ehrman chairs the Department of Religious Studies at the University of North Carolina at Chapel Hill and is a widely regarded authority on the history of the New Testament. I think it would help potential listeners to understand this is a book primarily about the process or science of textual criticism and how scholars study origins of text and reach conclusions about which version might or might not be original. I found it fascinating. New testament as the subject of textual criticism would only be relevant or interesting to someone with a Christian background or understanding, especially if you've been involved in some of the in-fighting among various sects of Christianity. If you are familiar with the debates about divine inspiration and care about other nit-picky details. You don't need 12 years of catholic school, but a basic knowledge and interest in the topic helps. If you're not involved in the debate over one word, if you are looking for dramatic expose, or a worldwide sinister conspiracy theory, you will be disappointed. There are no shocking revelations. Its about an added sentence here or there, a single changed word, either deliberate or accidental. Its about why and how someone today would identify what words are suspect and which of various scripts might be original and how they can tell the difference. The basic story of the new testament doesn't change all that much, if at all. 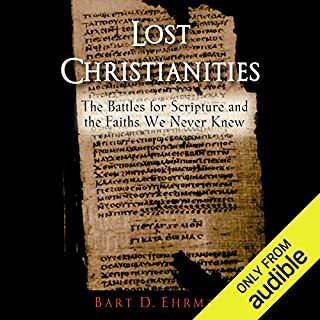 I think the narrator is a must, he does an excellent job explaining new concepts of textual criticism that wouldn't be familiar to the non-scholar. There's nothing too hard to understand, but for someone not familiar with the terminology, its much easier if you have someone read it and use proper pronunciation and inflection throughout the sentences. I think this is a book that lends itself to being read aloud that reading the text yourself. I have been waiting for a book like this to come along since I was in college over 30 years ago. 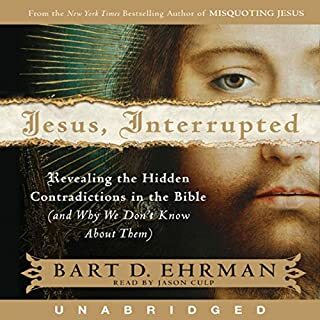 Ehrman does a terrific job exploring the difficulties that scholars have in reconstructing the urtext from the available sources. It's not just conflicting versions, but undoing the "corrections" of earlier editors, and a host of other things that I won't even try to get into here. Even if you are not religious, this book is enlightening about the problems surrounding any ancient text. If you are religious, this book opens up some new dimensions on how to interpret the words of the New Testament. 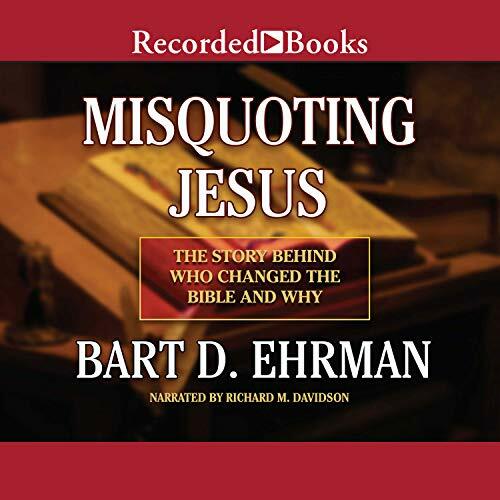 The author of Misquoting Jesus leaves you wondering, almost until the end, just what his personal beliefs are. I enjoyed this book all the more because of that. The information is presented very objectively. What did you love best about Misquoting Jesus? 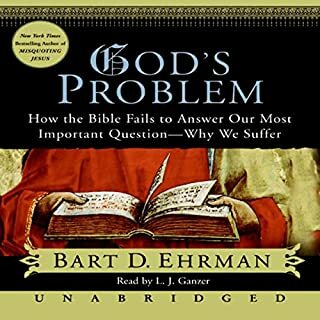 Bart Ehrman has a way of communicating his years of research to the general public which, in my opinion, make total sense! The narrator was good, but honestly I'd rather have Bart Ehrman narrate his own books. He has a great speaking voice and is good at engaging with his audience. I was very impressed with the research that went into this book. It was very easy to understand and very logical. I would highly recommend this book to anyone who wants to know how the bible came to be written. HOW JESUS CAME TO SPEAK IN RED ENGLISH WORDS! This is a serious book, well-narrated and a not difficult listen for regular lay-persons of any religious preference. The author is quite neutral, matter-of fact, though with a Protestant born-again background. You could sit there with your King James on your lap, scribbling furious notes. Or you could just keep knitting and listen twice as I did. I don't like the title at all. It suggests a flippancy or jokester element that is not in the book. We are all misquoting Jesus simply because the original texts are lost and nobody had a tape recorder running when Jesus was teaching. His first listeners and everyone since have done the best they could. Really. The author is a fine scholar who built on his youthful passion for Bible study and went so far as to learn the original languages and immerse himself in the absorbing study of ancient documents, second-guessing the old scribes, reasoning through all the whys and wherefores. What this book does is impress the lay-person with how much he doesn't know, can't know, and has to trust the scholars about. 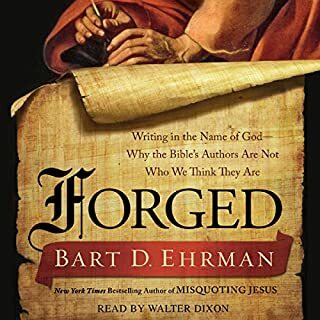 Mr. Ehrman gives fascinating specific examples of the kinds of mistakes that were made over centuries of copying -- some accidental, some deliberate tweaking in a time before printing presses or copy machines. There was no respect for copyright. If material was being dictated, a word that sounded similar might be substituted inadvertantly. I majored in English, so studied Chaucer and Shakespeare. I understood that the King James Bible was not telling me to go in my clothes CLOSET to pray among the boots and tennis shoes, although that could be a good place. I also came through a rigorous Sunday School and Bible study regimen as a kid. One college required four units of religion for graduation. That expanded my understanding. A visit to the un-Holy Land helped as well. This author does not speak down to anyone. He manages to include all of us as his friends and fellow students. I stayed interested. I can only imagine how difficult it would be to decide where to stop in taking up this study. Does an eager young person learn Latin, Greek and Hebrew and start studying old documents -- or does she learn enough to appreciate the more thorny passages, the major puzzles, and then proceed to ministerial life? This is the stuff of entire lifetimes! I have to think of the people who want to learn the computer, starting with bits and bytes and ones and zeros. They don't understand that they can learn to click a mouse and be gaming on FaceBook by suppertime! At any rate, this is a book I think the whole family would enjoy together, although I would never ever insist any child sit and listen! The old folks could play it on a road trip and the kids pick up a bit by osmosis. Even a teen would best find this subject gently for himself. The author gives a history of this study of Biblical texts so that we can investigate further to our heart's content. Huge subject! Absorbing listen! 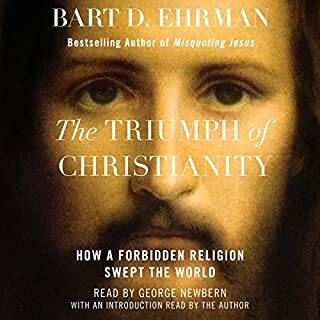 I recommend you first try the book Ehrman wrote after this one, "Jesus Interrupted". It steps back from the details presented in this book to give a better understanding of how the Bible developed. Then, if you want to delve deeper into the details of the New Testament, get this one. It is a surprise to find this kind of audiobook available. For those of us who know about textual criticism this is a good exercise and refresher on how the ancient and surviving texts and their redaction shape and are shaped by the powerful forces in the history of the church. 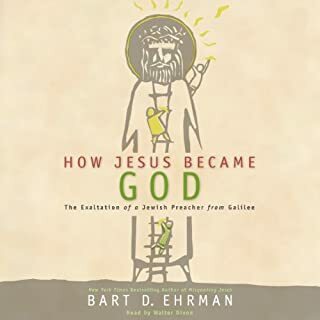 Just the fact that a technical and scholarly book like this is available at Audible is a big surprise -- whether one agrees with the author's thesis or not. Dr. Erhman does a very good job of helping people to understand the cannon of Scripture and the differences in the manuscripts and how personal beliefs influenced the people transcribing those manuscripts. Very illuminating. A very good course in understanding the New Testament. Enjoy! Warning: May not be suitable or might upset those with a KJV only belief. I took 3 years of koine (Biblical) greek in college and am aware of the textual variants in the texts of the New Testament. And while the author is upfront about his bias and purpose in writing the book, he glosses over some significant points. 1. Counting textual variants. A textual variant is counted for every manuscript, even if that manuscript is a known copy. So once a scribe made a mistake, every copy of the document is counted as a textual variant even when it is a part of the same family of texts. 2. Many of the textual variants cited do not exist in the Bible today, but the author presents them as though these are widely distributed texts. A small number of these variants appeared in certain areas, but the widely accepted text that has been passed down is generally the same. 3. The author presents the pseudoprigrapha texts (Gosepl of Thomas, etc.) as equally valid as the 4 accepted Gospels of the New Testament. However, these texts were never accepted by the majority of the early church and were not viewed as credible in their own time. But the author paints the picture of a broad conspiracy of proto-orthodox believers to exclude these texts, without regard for their content or historical context. There are a number of issues that the author and I agree on, this was an enjoyable read, for the $5 I paid during an audible sale.